This is a fascinating and insightful paper by Willem Buiter and Anne Sibert on the failure of the Icelandic banking system, but with scary parallels to the UK system and others. In particular though, and of interest to everyone possibly is section 2.1 copied below in full. It defines the generic vulnerability that all banks’ have to “run a on the bank” even in good times. Thus the argument goes, accept reality, nationalise the banks, and treat basic banking as a utility, just like water and electricity, until a better model can be developed that would have a better chance of surviving the coming sovereign debt crisis and transitioning into the new economic world that we are facing. I fear the feeble attempts by heads of state of the western world to address banking and banks’ problems is failing, because banking is not understood. There is no such thing as a safe deposit-taking bank on its own, even if its assets are of good quality and it has enough liquid assets to cope with normal variations in the net flow of deposits and other short-term liabilities. The events since August 2007, and in particular the demise of Northern Rock in the United Kingdom and Bear Stearns in the United States, have made it clear that any highly leveraged institution with assets that are mostly long term and illiquid and liabilities that are mostly short term can be subject to a catastrophic liquidity shortage. In the case of deposit-taking institutions, the canonical liquidity crisis is a bank run. Deposits can be withdrawn on demand and those who wish to withdraw are paid on a first-come, first-served basis. A bank run can occur if it is believed rightly or wrongly that a bank is balance-sheet-insolvent (with assets worth less than liabilities). But, as assets are illiquid, a bank run that cripples the bank is always possible, even if the bank is not believed to be balance-sheet insolvent: if each depositor believes that all other depositors are going to withdraw their assets then each depositor’s rational response is to withdraw his own. The outcome a bank run validates the depositors’ beliefs: it is individually rational, but socially disastrous. The risk of cash-flow insolvency inability to meet one’s obligations including the obligation to redeem deposits on demand for cash is always present when assets are illiquid. For highly leveraged institutions that fund themselves mainly in the wholesale capital markets, including the asset-backed securities and asset-backed commercial paper markets, an analogous event is possible: in the belief that other creditors will be unwilling to roll over their loans to a borrower whose obligations are maturing or to purchase the new debt instruments the borrower is issuing, each creditor finds it optimal to refuse to roll over his own loans or to purchase the new debt instruments the borrower is trying to issue, let alone to extend new credit. As with a classic bank run, this scenario can occur even when the assets of the bank are believed to be sound, if only they could be held to maturity. President Bush makes an important point and distinction here [emphasis mine]. The couch economists and newly found supporters of a new President are tempted by talk of new regulation and government control. Returning to the cause of the credit crunch, Mr Bush admitted that failures had been made "by lenders and borrowers, by financial firms, by governments and independent regulators". But that the answer was "not to try to reinvent the system". Instead, he said the solution was to "fix the problems we face, make the reforms we need, and move forward with the free market principles that have delivered prosperity and hope to people around the world". He added that while capitalism was "not perfect", it was "by far the most efficient and just way of structuring an economy". "It would a terrible mistake to allow a few months of crisis to undermine 60 years of success," said President Bush. Clearly there are issues that caused the current problem, and the first paragraph is one I have discussed frequently here. The lack of transparency, in the orchestration of securitised mortgages as they are converted into ABCP is certainly at the core of the issue here. Whether regulation, control, bank audits, new financial alternatives – this must be fixed. But if we think about it, new regulation on that would only serve to protect banks from purchasing securities that they did not understand. Did I just understand what I just said. We need protect banks from themselves and their own uninformed decisions? This is why the notion of regulation is hard. The nature of the regulation that what the G20 ought to consider this weekend is regulation that assesses the outcome of good and bad decisions, rather than attempt to regulate markets, and their processes. That result is determined by measurement (accounting rules) and capacity to absorb losses (capital requirements). All President Bush is saying with that headline is that lets not throw the bay out with the bath water. Worse, lets not become so technocratic that business decision making is over-ridden by government controls that could well produce dysfunction the likes of which might make the current crisis seem like a walk in the park. The press is all doom and gloom at the moment. Not without reason, but the causes and implications are getting blurred. So I did a simple analysis comparing three stock markets, their fall since mid 2007, and the relative importance of the banking sector in that fall. The results suggest that it does depend where you live. There is an all out banking crisis in the US and UK, based on market sentiment. 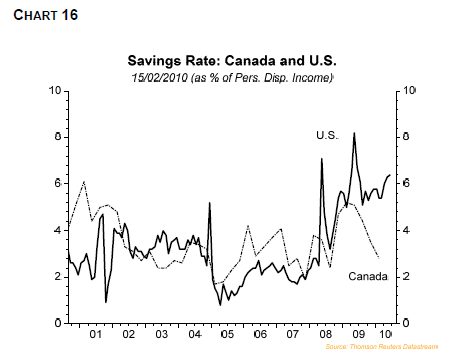 Somehow Canadian banks are not regarded with such fear as the others. This no doubt partly due to the early work of Purdy Crawford and the Federal Governments efforts last year to manage the $35bn in ABCP. In retrospect this was a far-sighted move (Fall 2007). In a very complex manouvre, they carved the $35bn held by smaller banks and investment houses into tranches that were backed by hastily arranged lines of credit from the Banks. In any event the outcome was an orderly shift away from certain bank or investment house bankruptcies.